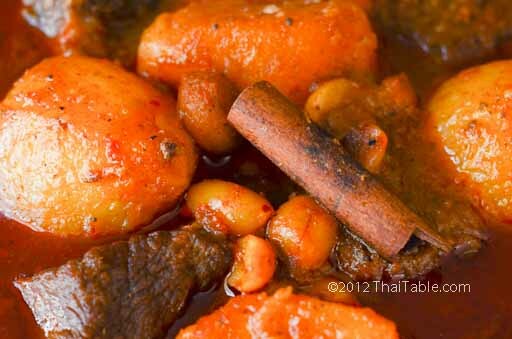 A very traditional Massaman Curry calls for Seville orange or som sah which is becoming more difficult to find in Thailand. I always have made massaman curry without the orange. Seville orange or som sah has lost its popularity, but is making a come back in the Thai culinary world. I was curious how the orange would add to this already delicious curry. I was not disappointed; the orange added a whole other dimension. 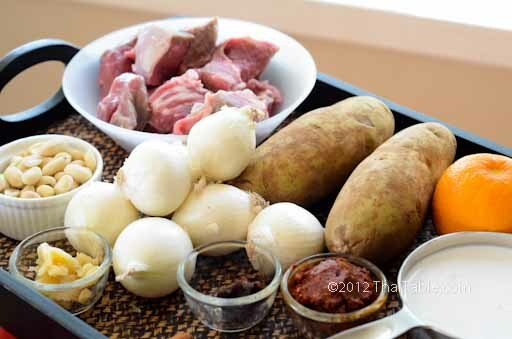 Massaman curry has many accompaniments. Some palaces serve massaman curry with mee grob, fried salted egg, beef jerky or crispy fried anchovies. Klong Bangluang residents (a large Muslim community 200 years ago) ate massaman curry with crunchy fried fish, watermelon and pickled mustard. Massaman Curry tastes best if it sits overnight. The spices will have penetrated into the bland potatoes. The sweetness in onions will have seeped out and blended in with the curry. The hand squeezed coconut milk contains a large ratio of water to coconut milk. However, the machine squeezed coconut milk that is sold in cans and UHT containers, has just coconut milk. In order to adjust the the fat content, I use water to fill the pot as opposed to coconut milk. To salt or not to salt: if you are using store-bought Massaman Curry Paste, taste the curry first before adding salt. Often, commercial curry pastes have high salt content. If needed, add ½ teaspoon at a time. No fish sauce needed. Traditionally, salt is used in flavoring curries, especially Massaman Curry. 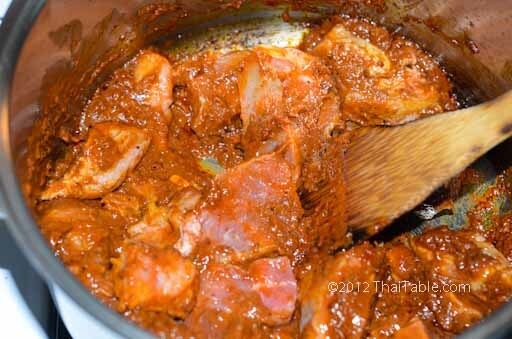 Fish sauce will add fish flavor which is not desirable in Massaman Curry. I used pearl onions because they keep together well during long simmer. It's pure aesthetic, not flavor. You can use cut pieces of large yellow onion as well, but they seem to disintegrate quicker. Substitution of Seville orange juice: mix lime juice and orange juice at 1 to 1 ratio. As the curry simmers, it may get very thick and reduced. Add some water as necessary. I make my own Massaman Curry Paste, but a store-bought one works well, too. Peel onions and potatoes. Squeeze the Seville orange to make 3 tablespoons of juice. Cut beef into 1 inch cubes. Cut potatoes into large chunks, approximately 2 inch cubes. If you are making a large pot and plan to eat it over several days, I recommends cut some beef and potatoes at different sizes. Serve the smaller sizes first. By the time you get the later days, large chunks of meat and potatoes will be tender. 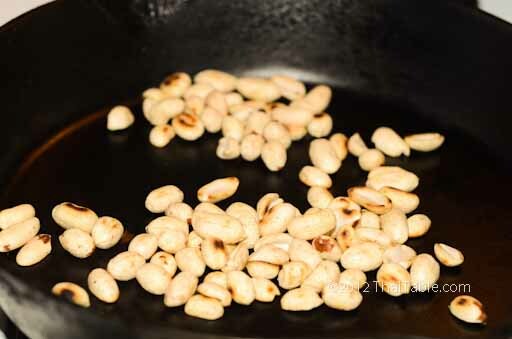 Toast peanuts in a pan until brown, over low to medium low heat, about 5-7 minutes. Add 2/3 of coconut milk to a large pot over medium heat. 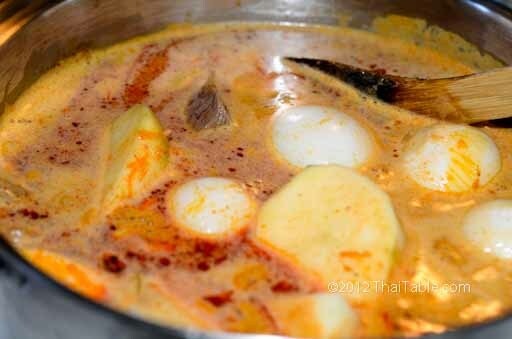 Add Massaman Curry paste into the pot. 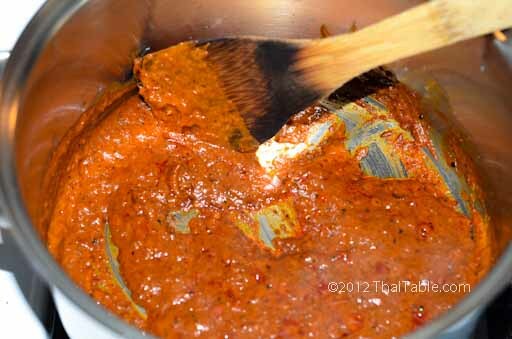 Stir to break up the curry paste. Mix it well with the coconut milk. Keep stirring to prevent the bottom from burning. After 3-5 minutes, you start see red oil bubbles up. Make sure you get a lot of oil out which is the signature of Massaman Curry by frying longer and add more coconut milk at this stage compared to making other Thai curries. The oil fries the spices and brings out the fragrance, flavors and color. Stir to coat the beef with sauce to brown the beef. The browning gives the beefs better texture and keep the beef together during simmering. Add the cubed potatoes, onions, the rest of coconut milk, water, cinnamon and bay leaf. Let the curry come to a simmer. Let it simmer for at least 1 hour or longer until the beef is tender. When the beef and potatoes are tender, add seasonings. Add palm sugar, tamarind, Seville orange juice and salt. 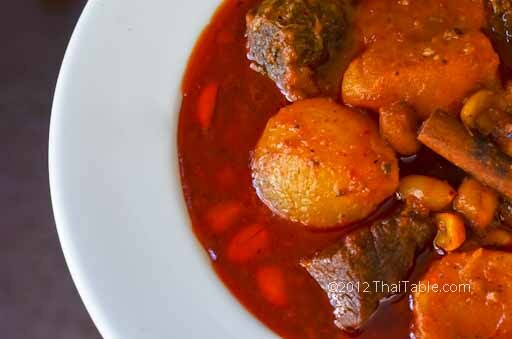 When Massaman Curry is ready, the potatoes and onions will have disintegrated somewhat and thickened the curry. The beautiful red oil will float on top. The toasted peanuts will be soft. The curry is fragrant with spices and toasted nuts. There are 3 flavors that you need to balance; sweet, salty and sour. The Massaman Curry that I like is more salty than sweet. The sour should be the last flavor that you taste and the least intense. Massaman Curry with Seville orange has a different twist with citrus flavor and different type of tartness. The sourness from citrus is sharp and clean compared to tamarind which has softer sweet and sour flavors. The meat should be near melting in your mouth. The potatoes should be soft and somewhat dissolved around the edges. Serve hot with rice and accompaniments of your choice.